Volatile organic compounds (VOCs) are organic chemicals that have a high vapor pressure at ordinary room temperature. Their high vapor pressure results from a low boiling point, which causes large numbers of molecules to evaporate or sublimate from the liquid or solid form of the compound and enter the surrounding air, a trait known as volatility. For example, formaldehyde, which evaporates from paint, has a boiling point of only –19 °C (–2 °F). Health Canada classes VOCs as organic compounds that have boiling points roughly in the range of 50 to 250 °C (122 to 482 °F). The emphasis is placed on commonly encountered VOCs that would have an effect on air quality. The European Union defines a VOC as "any organic compound having an initial boiling point less than or equal to 250 °C (482 °F) measured at a standard atmospheric pressure of 101.3 kPa." The VOC Solvents Emissions Directive is the main policy instrument for the reduction of industrial emissions of volatile organic compounds (VOCs) in the European Union. It covers a wide range of solvent using activities, e.g. printing, surface cleaning, vehicle coating, dry cleaning and manufacture of footwear and pharmaceutical products. The VOC Solvents Emissions Directive requires installations in which such activities are applied to comply either with the emission limit values set out in the Directive or with the requirements of the so-called reduction scheme. 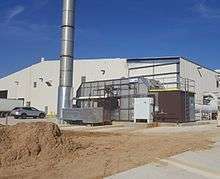 Thermal oxidizers provide an air pollution abatement option for VOCs from industrial air flows. VOCs (or specific subsets of the VOCs) are legally defined in the various laws and codes under which they are regulated. Other definitions may be found from government agencies investigating or advising about VOCs. EPA regulates VOCs in the air, water, and land. The federal regulations issued under the Safe Drinking Water Act list several organic compounds. EPA also publishes testing methods for chemical compounds, including a range of VOCs. In addition to drinking water, VOCs are regulated in pollutant discharges to surface waters (both directly and via sewage treatment plants), as hazardous waste, but not in non-industrial indoor air. The Occupational Safety and Health Administration (OSHA) regulates VOC exposure in the workplace. Volatile organic compounds that are classifed as hazardous materials are regulated by the Pipeline and Hazardous Materials Safety Administration while being transported. MTBE was banned in certain states within the US around 2004 in order to limit further contamination of drinking water aquifers (groundwater) primarily from leaking underground gasoline storage tanks where MTBE was used as an octane booster and oxygenated-additive. EPA has found concentrations of VOCs in indoor air to be 2 to 5 times greater than in outdoor air and sometimes far greater. During certain activities indoor levels of VOCs may reach 1,000 times that of the outside air. Studies have shown that individual VOC emissions by themselves are not that high in an indoor environment, but the indoor total VOC (TVOC) concentrations can be up to five times higher than the VOC outdoor levels. New buildings especially, contribute to the highest level of VOC off-gassing in an indoor environment because of the abundant new materials generating VOC particles at the same time in such a short time period. In addition to new buildings, we also use many consumer products that emit VOC compounds, therefore the total concentration of VOC levels is much greater within the indoor environment. Measurement of VOCs from the indoor air is done with sorption tubes e. g. Tenax® (for VOCs and SVOCs) or DNPH-cartridges (for carbonyl-compounds). The VOCs adsorb on these materials and are afterwards desorbed either thermally (Tenax®) or by elution (DNPH) and then analyzed by GC-MS/FID or HPLC. Reference gas mixtures are required for quality control of these VOC-measurements. Furthermore, VOC emitting products used indoors, e. g. building products and furniture, are investigated in emission test chambers under controlled climatic conditions. For quality control of these measurements round robin tests are carried out, therefore reproducibly emitting reference materials are ideally required. Limit values for VOC emissions into indoor air are published by e.g. AgBB, AFSSET, California Department of Public Health, and others. These regulations have prompted several companies to adapt with VOC level reductions in products that have VOCs in their formula, such as BEHR, KILZ, and Benjamin Moore & Co. in the paint industry and Weld-On in the adhesive industry. ↑ "Plants: A Different Perspective". Content.yudu.com. Retrieved 2012-07-03. ↑ "What does VOC mean?". Luxembourg: Eurofins Scientific. Retrieved 2012-07-03. ↑ "CARB regulations on VOC in consumer products". Consumer Product Testing. Eurofins Scientific. 2016-08-19. ↑ "Definitions of VOC and ROG" (PDF). Sacramento, CA: California Air Resources Board. November 2004. ↑ Health Canada Archived February 7, 2009, at the Wayback Machine. ↑ The VOC solvent emission derective EUR-Lex, European Union Publications Office. Retrieved on 2010-09-28. ↑ For example, "Water Basics Glossary". Reston, VA: U.S. Geological Survey. 2013-06-17. ↑ "Table of Regulated Drinking Water Contaminants: Organic Chemicals". Ground Water and Drinking Water. Washington, D.C.: U.S. Environmental Protection Agency (EPA). 2016-07-15. ↑ For example, Method 1624, Revision B: Volatile Organic Compounds by Isotope Dilution GC/MS. Clean Water Act Analytical Methods (Report). EPA. 1984. ↑ For example, discharges from chemical and plastics manufacturing plants: "Organic Chemicals, Plastics and Synthetic Fibers Effluent Guidelines". EPA. 2016-02-01. ↑ Under the CERCLA ("Superfund") law and the Resource Conservation and Recovery Act. 1 2 "Volatile Organic Compounds' Impact on Indoor Air Quality". EPA. 2016-09-07. 1 2 Goldstein, Allen H.; Galbally, Ian E. (2007). "Known and Unexplored Organic Constituents in the Earth's Atmosphere". Environmental Science & Technology. 41 (5): 1514–21. doi:10.1021/es072476p. PMID 17396635. ↑ Niinemets, Ülo; Loreto, Francesco; Reichstein, Markus (2004). "Physiological and physicochemical controls on foliar volatile organic compound emissions". Trends in Plant Science. 9 (4): 180–6. doi:10.1016/j.tplants.2004.02.006. PMID 15063868. ↑ Behr, Arno; Johnen, Leif (2009). "Myrcene as a Natural Base Chemical in Sustainable Chemistry: A Critical Review". ChemSusChem. 2 (12): 1072–95. doi:10.1002/cssc.200900186. PMID 20013989. ↑ Xie, Jenny. "Not All Tree Planting Programs Are Great for the Environment". City Lab. Atlantic Media. Retrieved 20 June 2014. ↑ Farag, Mohamed A.; Fokar, Mohamed; Abd, Haggag; Zhang, Huiming; Allen, Randy D.; Paré, Paul W. (2004). "(Z)-3-Hexenol induces defense genes and downstream metabolites in maize". Planta. 220 (6): 900–9. doi:10.1007/s00425-004-1404-5. PMID 15599762. ↑ Bernstein, Jonathan A.; Alexis, Neil; Bacchus, Hyacinth; Bernstein, I. Leonard; Fritz, Pat; Horner, Elliot; Li, Ning; Mason, Stephany; Nel, Andre; Oullette, John; Reijula, Kari; Reponen, Tina; Seltzer, James; Smith, Alisa; Tarlo, Susan M. (2008). "The health effects of nonindustrial indoor air pollution". Journal of Allergy and Clinical Immunology. 121 (3): 585–91. doi:10.1016/j.jaci.2007.10.045. PMID 18155285. ↑ Wolkoff, Peder; Kjaergaard, Søren K. (2007). "The dichotomy of relative humidity on indoor air quality". Environment International. 33 (6): 850–7. doi:10.1016/j.envint.2007.04.004. PMID 17499853. 1 2 3 Wang, Shaobin; Ang, H.M.; Tade, Moses O. (2007). "Volatile organic compounds in indoor environment and photocatalytic oxidation: State of the art". Environment International. 33 (5): 694–705. doi:10.1016/j.envint.2007.02.011. PMID 17376530. 1 2 Yu, Chuck; Crump, Derrick (1998). "A review of the emission of VOCs from polymeric materials used in buildings". Building and Environment. 33 (6): 357–74. doi:10.1016/S0360-1323(97)00055-3. ↑ Irigaray, P.; Newby, J.A. ; Clapp, R.; Hardell, L.; Howard, V.; Montagnier, L.; Epstein, S.; Belpomme, D. (2007). "Lifestyle-related factors and environmental agents causing cancer: An overview". Biomedicine & Pharmacotherapy. 61 (10): 640–58. doi:10.1016/j.biopha.2007.10.006. PMID 18055160. ↑ Who Says Alcohol and Benzene Don't Mix? Archived April 15, 2008, at the Wayback Machine. ↑ Dales, R.; Liu, L.; Wheeler, A. J.; Gilbert, N. L. (2008). "Quality of indoor residential air and health". Canadian Medical Association Journal. 179 (2): 147–52. doi:10.1503/cmaj.070359. PMC 2443227 . PMID 18625986. ↑ Jones, A.P. (1999). "Indoor air quality and health". Atmospheric Environment. 33 (28): 4535–64. doi:10.1016/S1352-2310(99)00272-1. ↑ Barro, R.; et al. (2009). "Analysis of industrial contaminants in indoor air: Part 1. Volatile organic compounds, carbonyl compounds, polycyclic aromatic hydrocarbons and polychlorinated biphenyls". Journal of Chromatography A. 1216 (3): 540–566. doi:10.1016/j.chroma.2008.10.117. PMID 19019381. ↑ Schlink, U; Rehwagen, M; Damm, M; Richter, M; Borte, M; Herbarth, O (2004). "Seasonal cycle of indoor-VOCs: Comparison of apartments and cities". Atmospheric Environment. 38 (8): 1181–90. doi:10.1016/j.atmosenv.2003.11.003. ↑ "Ecolabels, Quality Labels, and VOC emissions". Eurofins.com. Retrieved 2012-07-03. ↑ Mendell, M. J. (2007). "Indoor residential chemical emissions as risk factors for respiratory and allergic effects in children: A review". Indoor Air. 17 (4): 259–77. doi:10.1111/j.1600-0668.2007.00478.x. PMID 17661923. ↑ Wolkoff, P.; Wilkins, C. K.; Clausen, P. A.; Nielsen, G. D. (2006). "Organic compounds in office environments - sensory irritation, odor, measurements and the role of reactive chemistry". Indoor Air. 16 (1): 7–19. doi:10.1111/j.1600-0668.2005.00393.x. PMID 16420493. ↑ "What is Smog? ", Canadian Council of Ministers of the Environment, CCME.ca Archived September 28, 2011, at the Wayback Machine. 1 2 Buszewski, B. A.; et al. (2007). "Human exhaled air analytics: Biomarkers of diseases". Biomedical Chromatography. 21 (6): 553–566. doi:10.1002/bmc.835. PMID 17431933. ↑ Miekisch, W.; Schubert, J. K.; Noeldge-Schomburg, G. F. E. (2004). "Diagnostic potential of breath analysis—focus on volatile organic compounds". Clinica Chimica Acta. 347: 25. doi:10.1016/j.cccn.2004.04.023. ↑ Mazzone, P. J. (2008). "Analysis of Volatile Organic Compounds in the Exhaled Breath for the Diagnosis of Lung Cancer". Journal of Thoracic Oncology. 3 (7): 774–780. doi:10.1097/JTO.0b013e31817c7439. PMID 18594325. ↑ MartíNez-Hurtado, J. L.; Davidson, C. A. B.; Blyth, J.; Lowe, C. R. (2010). "Holographic Detection of Hydrocarbon Gases and Other Volatile Organic Compounds". Langmuir. 26 (19): 15694–9. doi:10.1021/la102693m. PMID 20836549. ↑ Lattuati-Derieux, Agnès; Bonnassies-Termes, Sylvette; Lavédrine, Bertrand (2004). "Identification of volatile organic compounds emitted by a naturally aged book using solid-phase microextraction/gas chromatography/mass spectrometry". Journal of Chromatography A. 1026 (1–2): 9–18. doi:10.1016/j.chroma.2003.11.069. PMID 14870711. ↑ Biasioli, Franco; Yeretzian, Chahan; Märk, Tilmann D.; Dewulf, Jeroen; Van Langenhove, Herman (2011). "Direct-injection mass spectrometry adds the time dimension to (B)VOC analysis". Trends in Analytical Chemistry. 30 (7): 1003–1017. doi:10.1016/j.trac.2011.04.005. ↑ Ellis, Andrew M.; Mayhew, Christopher A. (2014). Proton Transfer Reaction Mass Spectrometry - Principles and Applications. Chichester, West Sussex, UK: John Wiley & Sons Ltd. ISBN 978-1-405-17668-2. ↑ Sulzer, Philipp; Hartungen, Eugen; Hanel, Gernot; Feil, Stefan; Winkler, Klaus; Mutschlechner, Paul; Haidacher, Stefan; Schottkowsky, Ralf; Gunsch, Daniel; Seehauser, Hans; Striednig, Marcus; Jürschik, Simone; Breiev, Kostiantyn; Lanza, Matteo; Herbig, Jens; Märk, Lukas; Märk, Tilmann D.; Jordan, Alfons (2014). "A Proton Transfer Reaction-Quadrupole inferface Time-Of-Flight Mass Spectrometer (PTR-QiTOF): High speed due to extreme sensitivity". International Journal of Mass Spectrometry. 368: 1–5. doi:10.1016/j.ijms.2014.05.004.